It’s spring time... for now... but always boot season. Amen to that! Almost all of our snow is gone, finally. The kids are out and about for Spring Break, plus St. Patrick’s Day made things even more lively today. I just wore my cowboy boots today. The 3” heels just blend right into the cowboy boot look. 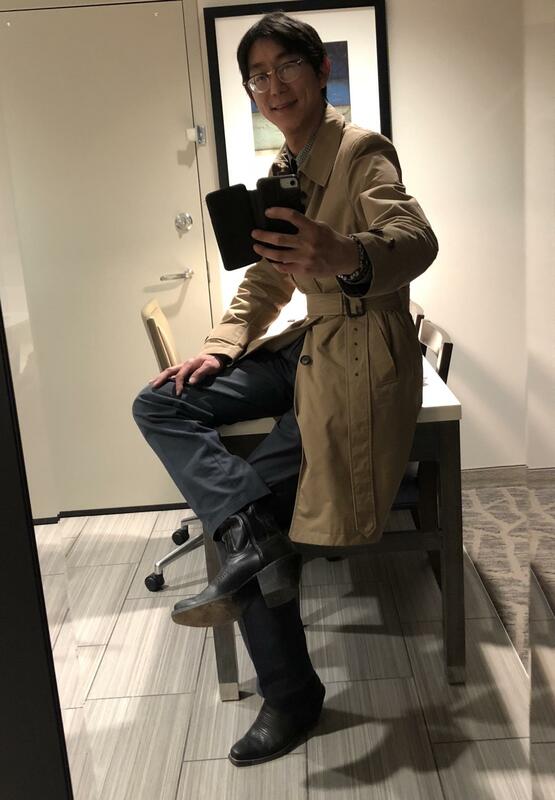 The slit in the pants tease - how tall are these boots really? Found a pair of pants tonight at Last Call. 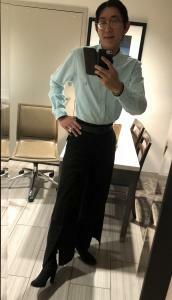 At first glance they are another pair of black office appropriate pants that blend with everything else. But this is my first experience with Lyocell fabric, which I am really liking so far. I refuse to wear the polyester fabrics that they put in many mens’ pants. Polyester breaths poorly and feel awful. This Lyocell and cotton blend, on the other hand, drapes and moves around really nicely. Sounds like you handled that with aplomb. Sounds like a positive compliment to me! I have worn these pants for about and hour and have already received a compliment on them. I was in the auto parts store this morning and the sales associate asked if I was a model. 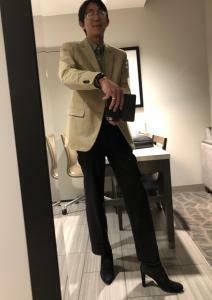 I gave a “don’t know what you’re taking about” look and he called out my pants and shoes. 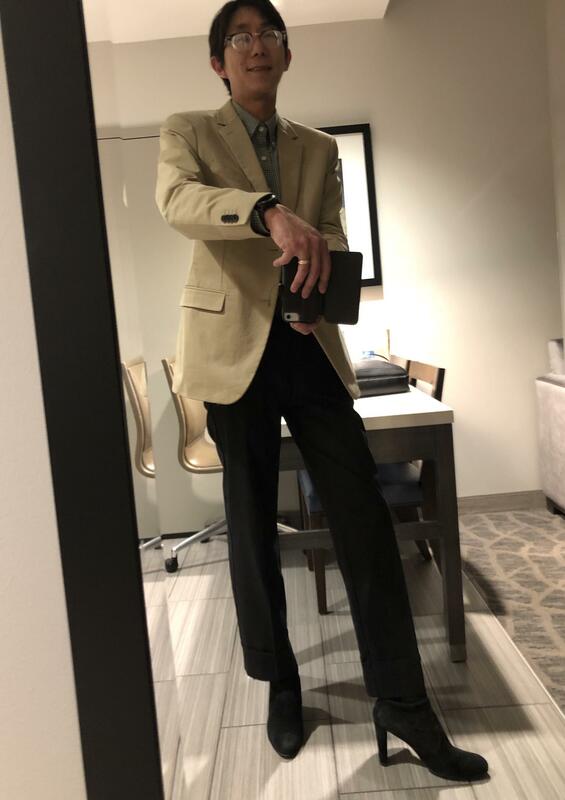 I told him no, I just like to look good! He liked that answer. Who knew $48 is all you have to spend on pants to get there. Guys, if you want to look like a model, wear heels! 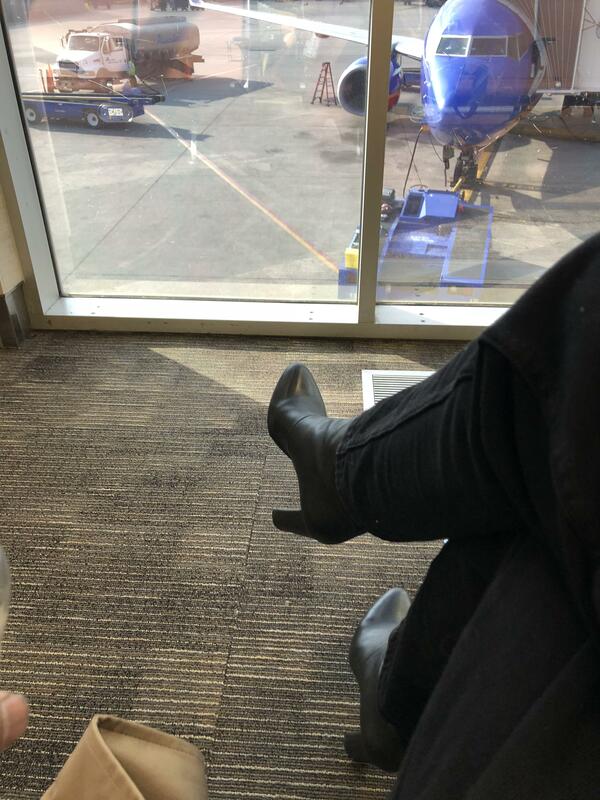 Taking another trip in heels. TSA lady looked at my boots on the conveyer belt and asked me to take my shoes off. I pointed down to my feet to confirm that they were off... guess she didn’t think they were mine at first lol. I knew a massive bodybuilder in college once who when he came into the dining hall was scolded by the woman at the door for wearing shoulder pads into dinner (she thought he was a footballer) He kindly explained that these were his real shoulders. There are plenty of people wearing boots in the office - it’s still boot and suede season up north. Sounds as though you have totally normalised the notion of men in heels within your sphere. That’s great! Good for you. Loving the look of these! 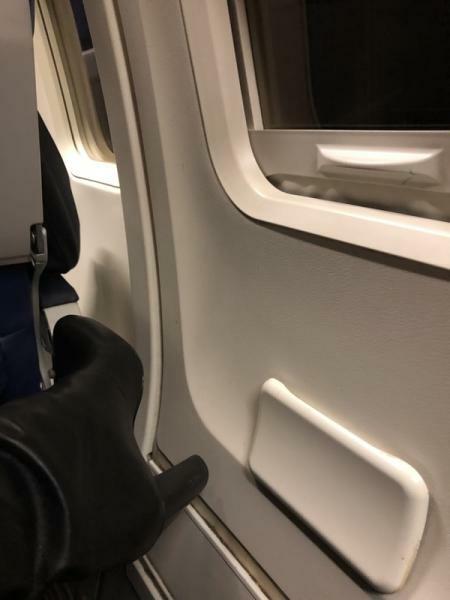 The training budget was tightened so I had to fly Southwest and zig zag on connecting flights across the midwest. But I am now way more comfortable power walking through the terminal in heels, so it was fun. The Maxes have been pulled out of service. I welcome slowing down the pace of replacing current fleets with marginally more efficient equipment. I love classics like the 757 and 767. And I love the 747. Wow what a plane!! You know it buddy....In my humble opinion, they have stretched those 737s out beyond their flying comfort zone/capability...The 757 is a much better plane than the stretched out 737s. The 767s are great also. The problem is that the airlines have not taken good care of these older planes, so mechanical delays are more common. Those 737max planes are a horror show from a passenger comfort or FA working stand point, too many seats, shrunken galleys and lavs. Needless to say, I am not a pilot, so can not comment on the current issues/grounding on the 737 max planes. Now, back on topic, tell us more about all the compliments you got! It’s still a learning process. I’m comfortable taking compliments and replying “thanks!” but am still getting used to talking more in depth about heels in person and outside of HHP. 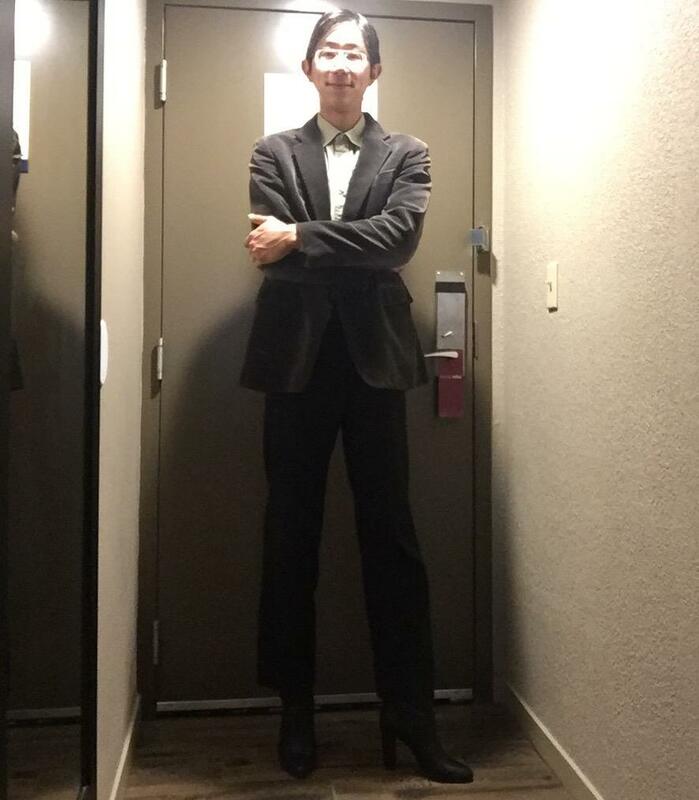 People almost always start talking about the effect of heels on height, saying things like “it must be nice to be taller.” This is somewhat awkward for me, because I am already 6 feet tall without heels, which is above average, especially for an Asian. 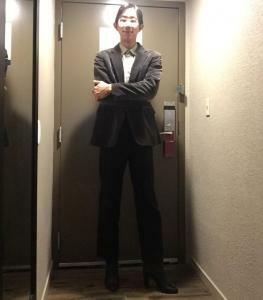 One lady said “I need to wear heels like that, I am so short,” and I started to reply that the additional height is not the reason I wear heels. She very promptly interrupted and said “oh of course not, you do it for the style!” This morning I realized she nailed it on the head! When people ask me “why are you wearing women’s shoes” or “why are you so tall” I want to help people understand my motive. I am not trying to be a woman or be taller or alter anything anatomically, but rather I am expanding my enjoyment of the rich diversity of different styles and looks in fashion. I will always have a soft spot for the 747. My parents immigrated to the United States on a 747 with their 3 year old son (me) and 2 suitcases, starting a new life here. Now I have way more than 2 suitcases just in boots!! I really like the A380, on which I have flown many, many thousands of miles but I guess they are heading for the boneyard - they had too much of what passengers wanted and not enough of what the beancounters at head office liked. As for carriers, I am quite spoiled I think by flying Qantas and Emirates regularly. As much as I like the 747, I picked the A380 over it on trips over the years because of the novelty of it. I really like the upper deck. I was fortunate enough once about three years ago to fly first class on Emirates from London to Australia on an A380. The level of luxury was obscene but golly, it was fun. Strangely - or perhaps not so strangely - I arrived in Sydney more tired than if I had flown economy, but that was only because I refused to waste a single second in sleep, but was up and about seizing the moment! Talk about gypsies in the palace! It’s still a learning process. I’m comfortable taking compliments and replying “thanks!” but am still getting used to taking more in depth about heels in person and outside of HHP. 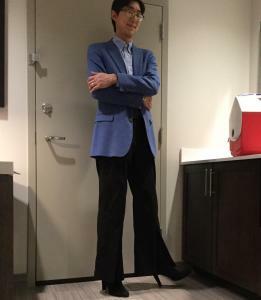 People almost always start talking about the effect of heels on height, saying things like “it must be nice to be taller.” This is somewhat awkward for me, because I am already 6 feet tall without heels, which is above average, especially for an Asian. We flew Qantas to and from (and within) Australia recently. The flight there was on a 787 and it was quite comfy; I actually slept fairly well, which I normally don't do. The flight back to LA was on a 380 and the seat was awfully uncomfortable for me (economy). I didn't get a wink of sleep. I'll be sure never to fly on a 380 again. I was NOT impressed. 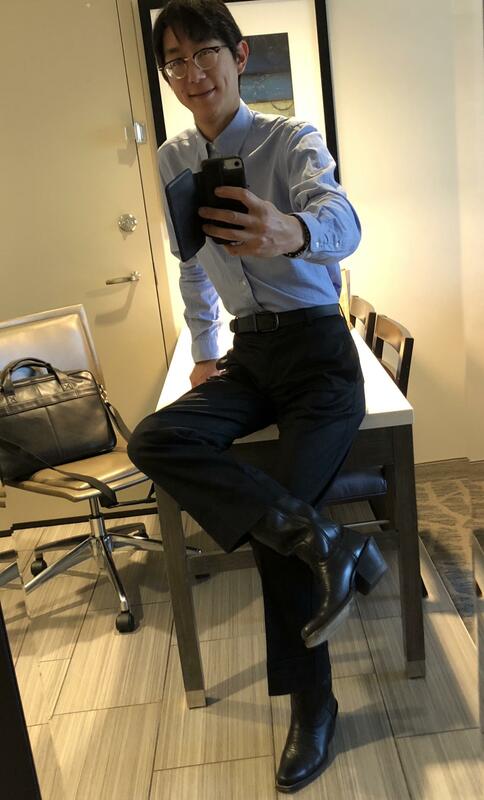 To keep on topic, I wore my Clarks "Octavia" clogs with 3" stacked heels, which I've featured in other posts. Clogs are easy to slip on and off. 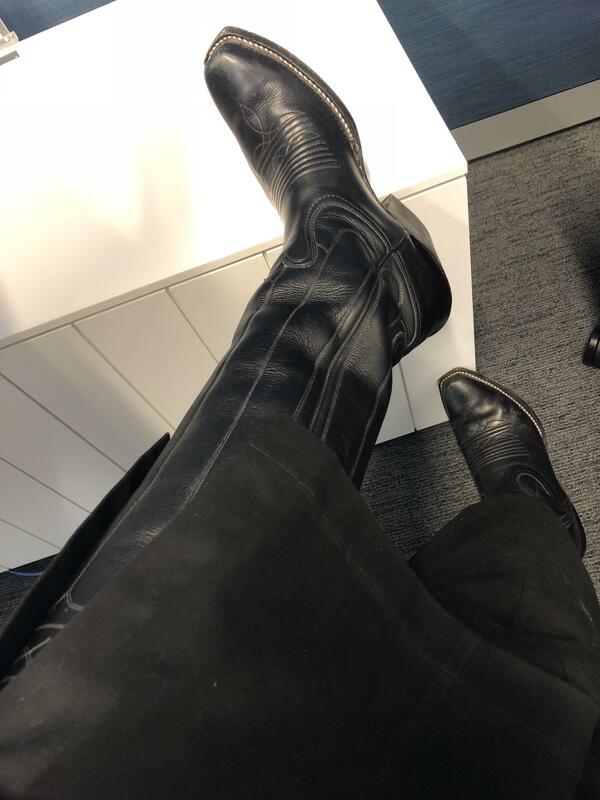 On the subject of boots and boot season, I have often mentioned that my knee boots pass unnoticed - and they always have. 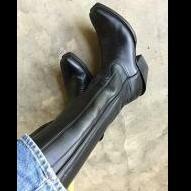 Today, however, when I was out with my wife at a tea and cake shop a woman came up saying how much she loved my boots and asking me where I got them. We had a nice chat. It was a bit of a pleasant surprise.